Sometimes you’ve got to look at things from a new perspective, like putting your jumper on backwards. I spotted an outfit that I really liked on Pinterest that I wanted to try and emulate myself. I had this jumper in mind when I was thinking about this outfit but with the low V neck front I wasn’t sure if it would look right. So instead I just popped it on backwards! It doesn’t completely sit perfectly on my front but I adore how it looks from the back. It just shows that if you try something a bit weirdly, it might actually work! The skirt is one I picked up in the Dorothy Perkins sale as an option for my holiday outfits but didn’t actually wear. It was only £12 and I really love it. 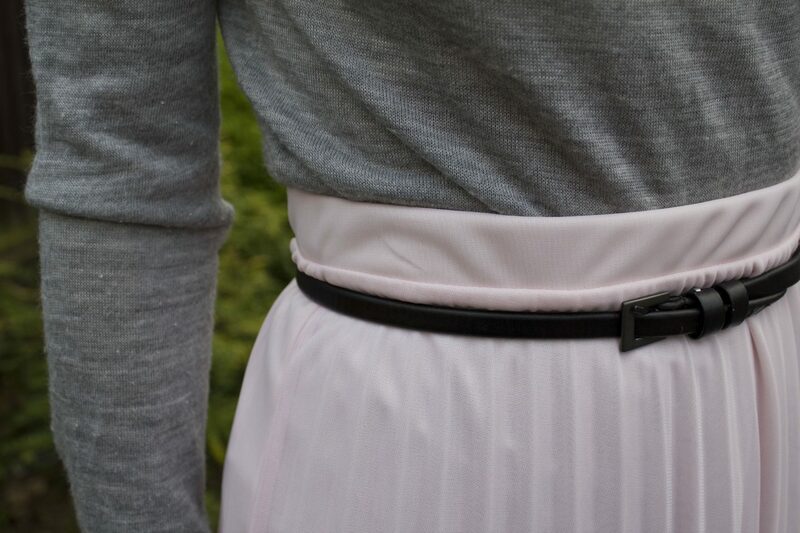 Its such a soft pink colour and I’m getting into the pleated skirt style. I fancy getting some more now I like this one so much. If you know of any good ones then point me in that direction! Also I have to mention its Halloween! Are you doing anything for it? Sadly I’m not, I desperately wanted to go to or have a party but no one I know really seemed up for it. Fancy dress is the best, I wish I was still at uni where it was socially acceptable all the time!